Roulette is probably one of the most famous of gambling pastimes. No brick-and-mortar casino is complete without a roulette wheel, and it’s no surprise that roulette games are extremely popular with online casino players too. Although some sites will have more variety than others, all our recommended casino sites offer roulette games. Online casinos offer animated roulette games with amazing graphics as well as live dealer roulette tables that really capture the ambience of a real roulette experience. Try your luck at the different variants of roulette and see which one you enjoy the most. If you’ve played roulette before, you shouldn’t have a problem understanding how to play the online versions. The game follows the same structure and if you get confused, you can always click the “info” or “help” button that appears in the game. Placing bets. Roulette offers a wide variety of bets to choose from. To place your bets on the roulette table, just pick your bet amount and use the mouse pointer to choose your betting target. You can bet on red or black, a specific number, even numbers, odd numbers, and groups of numbers. The dealer releases the ball onto the spinning roulette wheel. As the wheel slows down, the ball comes to rest on a certain number. If it’s your number, color, or group, you win! If you win, the dealer will leave your chips on the table and you can choose to “let it ride”. This means repeating your previous bet, with your added winnings. You might want to bet on your favorite number to see how lucky it really is, but you probably shouldn’t stick to that strategy. You need to be very lucky to hit a single-digit bet, and to do it more than once, much more so. By playing the black-red, high-low, odd-even bets, your odds at winning are much better. Every spin is a snowflake; unique and completely uninfluenced by the result of the previous spin. For every new spin, the probabilities of the various results and combinations remain the same, irrespective of what came before. There’s a lot of “information” online about how to beat the house by playing roulette. We will cover some of the more popular roulette strategies in another article and also tell you about which methods are complete hogwash. But while there are strategies to improve your odds playing roulette, the house has a statistical edge, as with other casino games. While your game preference is completely up to you, keep in mind that the American version of roulette favors the house more so than the European and French versions. The extra 00 marker on the American roulette wheel slighter lowers a player’s chances of winning. Read the bonus terms and conditions of the specific casino you’re playing roulette at. Most online casinos will only credit a certain percentage of your roulette play towards your wagering requirements. Low Bet: A bet placed on the low range of numbers, from 1 to 18. High Bet: A bet placed on the high range of numbers, from 19 to 36. En Prison Rule: This applies to even-odds bets only. When the ball hits a zero, the player has 2 options. The first is to reclaim half the bet and lose the other half. The second is to leave the bet for another all-or-nothing gamble – if the bet wins, the original wager is returned, if not, the entire bet is lost. La Partage Rule: Similar to En Prison only that in this case the player doesn’t choose and simply loses half the bet in cases where a zero is hit. Frozen: When the roulette board is frozen, no new bets can be made and existing bets can’t be changed. 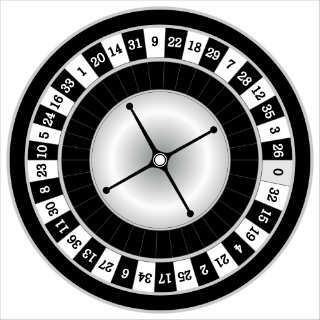 The European roulette wheel includes the numbers 1 to 36, of which half are red and half black. There is also a green zero (0) which breaks the 50-50 odds of hitting either black or red. This is how the casino maintains a house edge. The American roulette wheel is exactly like the European one, but also has an additional symbol – a green double zero (00). The addition of this second neutral result is why American roulette has a bigger house advantage than European roulette. French roulette is played in much the same way as European roulette. The difference is in the layout of the betting board, but other than that, the odds and betting possibilities are the same. Fans of online roulette have a lot to be happy about in 2017. First of all, the first prototype of a virtual reality gambling game was showcased this year, and it just so happens that it was a roulette game. At the ICE conference in London in February, software developer Net Entertainment (also known as NetEnt) let visitors at the conference experience playing roulette in a virtual reality environment. The game was basically a 3D roulette setup floating in space with robots as dealers. It looked really cool and it really makes you wonder about the amazing possibilities that this technology can have for online gambling in general. Another great thing about being a roulette fan in 2017 is the amazing selection of mobile roulette games on offer. Finding a good mobile roulette version that worked smoothly and was fun to play used to be a bit of an issue. Now, all of our recommended online casinos offer play from any type of mobile device, iOS or Android-based, smartphone or tablet. And what’s more, these online casinos don’t just offer one roulette game. They all have a variety of roulette versions. Expect to find American, French, and European roulette versions as well as a multitude of other lesser known roulette titles which are great for mixing things up and trying out different strategies. Playing roulette at online casinos can be very entertaining. You can learn about the different variants and odds for the different combinations, or just have fun and see where lady luck takes you. Remember that online casinos won’t usually count all your roulette play towards your wagering requirmenets. So if you’re looking to redeem a bonus, read the terms and conditions of the casino you’re playing at to see how they credit roulette play. Good luck!